Catholic Mission in the Church of England: unity in diversity. Earlier this year, in September, together with Fr. Peter, I took part in a mission conference called, “God’s Church int he world – the Gift of Catholic Mission.” The conference was organised jointly by Forward in Faith and Anglican Catholic Future. It was a rather unique experience for me as a pastoral assistant as I got to meet great minds of the Anglican Church as well as attend lovely and inspiring services. 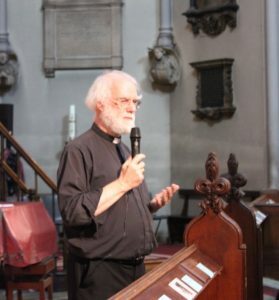 The first day started with a beautiful lecture by former Archbishop of Canterbury Dr. Rowan Williams at the church of St. Dunstan in the West in Fleet Street. The point of his lecture and of the whole conference was how we can make our Catholic Mission within the Church of England nowadays relevant, putting aside differences by respecting them but aiming at a common goal, how to follow the historical apostolic and sacramental tradition of the Church in such a age of refusal for tradition. The day concluded with a splendid service of Choral Evensong and Benediction at which the whole congregation of roughly 150 clergy sang with gusto the beautiful hymn Jerusalem the Golden. 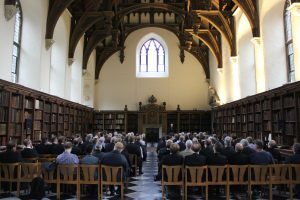 My favourite day was probably the second, we translated the conference to Lambeth Palace, where Archbishop Justin Welby, gave us an introduction and a general welcome to his home, pointing out how he was happy to see us “existing” and working together. Throughout the day we were invited to attend various lectures related, again, to the mission of the Catholics in the Church of England and how we should react to change, I personally attended two lectures by Fr. Robin Ward of St. Stephen’s House, related to vocations and training within the Anglican Church, both interesting and terrifying at the same time! At noon, the Bishop of Fulham celebrated mass in the palace’s episcopal chapel. It was the one day where we were let to engage with each other in conversations more freely and I exchanged some rather interesting points with those there. Finally, we moved to the palace of the Bishop of Fulham for a lavish dinner party. 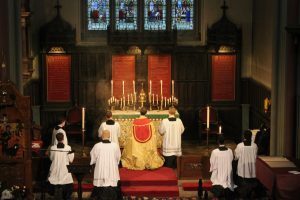 The third day, in the morning it all concluded with another high mass at St. Dunstan’s by the Bishop of Fulham and the conference, of which I took many lovely pictures! They were quite an exciting few days, and it made me glad of seeing how Anglican Catholics of different views can still work together and respect each other, as well as recognising each other’s ministries, in a true message of Catholic unity that is so needed in the disrupted Church of the present day. Christ must always be our focus.